Is Novo Resources Worth $600 Million At This Point? To be clear, I’m not suggesting that Novo is not for real. It very well could be. What I’m stressing is that very little is known about what Novo may or may not have at Karratha based on the information that has been gathered by the Company and released to the public. Just like the pretty pictures of beautiful gold nuggets from outcroppings at Karratha that Novo has put in its corporate presentation, I can show you pictures given to me from the management at Eurasian Minerals from its Koonenberry project in Australia of beautiful gold nuggets collected from “coarse gold” samples. That was eight years ago and the project has not been advanced from that time. In general, it is unlikely that anything above an inferred mineral resource can be estimated from surface sampling and assaying that has been on Karratha’s coarse gold environment. While coarse gold can be indicative of a high-grade gold-bearing system beneath the surface, the presence of very high grade nuggets of coarse gold do not guarantee it. Economic grades of gold are generally contained within discrete ore shoots and are surrounded by low-grade material. The presence of coarse gold can complicate the exploration process. I exchanged emails with a senior officer at another mining company with an Australian presence to see if he had any knowledge or thoughts on Novo’s situation. He said that Quinton Hennigh (Chairman) “has a real nose for this stuff.” But, as I have suggested above, he admitted that only underground drilling (much deeper than the couple of bulk samples produced from trenching) will tell us where the real source of the gold is, assuming it’s there to be found. This is a project that will take years to explore and assess. I’m guesstimating at this point the project would be 8-10 years away from transitioning into a commissioned mining operation. Between now and then there’s is a substantial amount of expensive exploration and de-risking that needs to occur. Again, the presence of high-grade course gold-bearing nuggets does not guarantee that an economically mineable resource exists below the surface. I’m not trying to discourage anyone from taking a shot at Novo. But the odds that it’s the next large deposit discovered (in excess of 10 million ozs) is small. My view is that this would be a great risk/return proposition if the stock were still under a $30-50 million market cap. For my risky investment allocation, I think Precipitate or Mineral Mountain represent better risk/return speculative bets than Novo at a $600 million market cap. NOTE – Subsequent Event: It was announced on September 5th that Kirkland Lake (KIRK, KL.TO, market cap of US$3.4 billion) would be investing up to $56 million for up 7.7% of Novo’s stock in a private placement. While this is a positive event in terms of providing the Company with additional funds for drilling, we still need to see drill results – and a lot of drill results. This does not change my overall view that the stock price has run ahead of itself given what is known about the potential mineralization on the project. I would sell into the move higher today and wait for the stock to pullback to a lower level before taking a longer term position in the Company’s stock. The stock closed at US$3.26 today (Thursday). In the last issue of the Mining stock Journal I recommended selling it at US$3.76. The stock is down 25.4% from its high-close (US$4.33) and 30.7% from its all-time high trade ($4.71). I’m not recommending avoiding the stock at all. This could be a very interesting speculative play. But it’s a function of the cost to invest. At $600 million, I will let others bear the exploration risk. If the stock were to pullback below $2 – and it might not – I will probably talk to my partners about putting some in the fund. I think the $1.40 area is a good entry point but it may never trade that low again. So where does this leave us? The entire sector has moved lower since early February. Maybe this was in anticipation of the GDXJ rebalancing “whispers” and maybe not. Often the miners will be hit before a manipulated take-down of the gold price is implemented. That narrative fits the chart above as well. It’s important to distinguish the difference between the propaganda and truth, because that’s where money can be made in the markets. The truth is that the sector has sold off after a nice move from the mid-December 2016 low. But I also believe that the market is setting up for another big move into the 3rd and 4th quarters. It may take all summer for this to materialize, but the economic, financial and geopolitical fundamentals, as they are unfolding, weigh heavily in favor of big move higher in the precious metals sector. 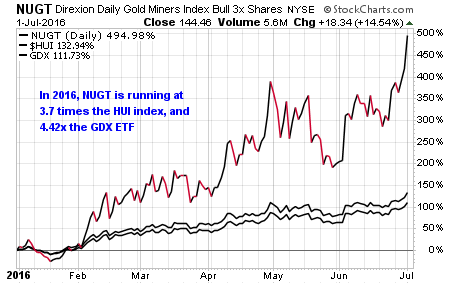 One other point I would like to make – something that you WILL NOT HEAR from Wall Street or from Rickards or from the financial media: since bottoming in mid-December, the HUI is up 14.7%, GDX up 16.1% and GDXJ up 15.3% vs the S&P 500 which is up 7.7%. The mining stocks, since bottoming in mid-December, have outperformed the S&P 500 over the same time period through today (June 15, 2017). Several of you have asked for ideas on the stocks in the GDXJ index that are “oversold” due to the rebalancing. As I’ve just demonstrated graphically and with ROR numbers, GDXJ has not really sold off since mid-April anymore than the larger-cap mining stocks in the HUI index and in GDX. Those are the numbers. I can’t make those up. It’s “narratives” that are fabricated. Having said that, I did present two ideas in the Mining Stock Journal which happen to be in the GDXJ. One is up 6% since May 4th – and it has a lot higher to move – and the other is up 20% since June 1st, with a lot more left in the move. A subscriber told me yesterday that a well-known subscription service that costs $1500/year is promoting 3 ideas from GDXJ. This is probably one of the services that is promoting the idea that the GDXJ has been hit unusually hard. I’ve shown above that idea is a false narrative. The Mining Stock Journal is $20/month with no minimum commitment. Subscriber turnover is exceptionally low for a reason. You can find out more about it here: MSJ Subscription Info. On Monday IRD published a reply to an article that was posted on Goldseek.com which theorized that capital was going to stop flowing to the junior mining stock sector because of the changes occurring at the GDXJ and JNUG ETF: No, The Junior Mining Stocks Are Not Going To Implode. In that reply I stated that, in the course of doing research for the Mining Stock Journal, that several junior mining stock CEO’s had recently told me that there was an enormous amount of capital coming into the sector from sophisticate pools of institutional investors and strategic players (other mining companies, private equity etc). This morning Mariana and Sandstorm Gold (SAND) announced a proposed merger transaction in which Sandstorm acquires MARL in a cash and stock transaction. The value offered based on SAND’s closing price yesterday (April 25th) of $4.04 is $1.41 (MRLDF basis). Mariana shareholders would end up holding 19% of the combined entity. Currently MRLDF is trading up 67.5% from yesterday’s close at $1.24 (C$1.70, up 67.5%). SAND is trading down 8% at $3.71 (down 33 cents), which is why MRLDF/MARL.V is trading at a discount to the proposed terms at yesterday’s closing price for SAND. If you want to remain an owner of SAND, the Mining Stock Journal would recommend holding on to MRLDF/MARL. With the drop in SAND’s stock price, I don’t know if Mariana shareholders will be able to coerce a revised to offer in order to bring the value back up to the value as presented in the announcement of the deal. MSJ has not conducted a thorough review of SAND and therefore is not in a position to recommend owning SAND going forward. I will probably issue an opinion in the next issue of MSJ (May 4th). For some reason the stock market hits the stock price of the acquiring company in mining stock deals that involve share issuance. This offer encompasses shares plus cash. If this were a transaction in any other sector of the market, the acquirer’s stock would be up in value this morning. I do believe that once the price of gold and silver head higher again, the price of SAND’s stock will recover. If that’s the case, there’s an easy 12% left in MRLDF. The Mining Stock Journal specializes in finding highly undervalued junior mining shares. It’s a bi-monthly, email-delivery based subscription service. You can find out more about subscribing using this link: Mining Stock Journal. Currently I am sending out all back issues to new subscribers. I get suspicious about an article when the author repeatedly, with much bravado, makes the claim the he is laying out facts and challenges anyone to present challenges to those “facts.” Typically that style of writing belies a conspicuous absence of facts. The author bases his premise that the GDXJ rebalancing and the related suspension of JNUG shares would strangle money available to finance junior mining shares. Nothing could be further from the truth. To begin with, investment capital does not flow into the juniors via GDXJ or JNUG. GDXJ is a quasi-derivative security that buys the stocks it holds on the secondary market. 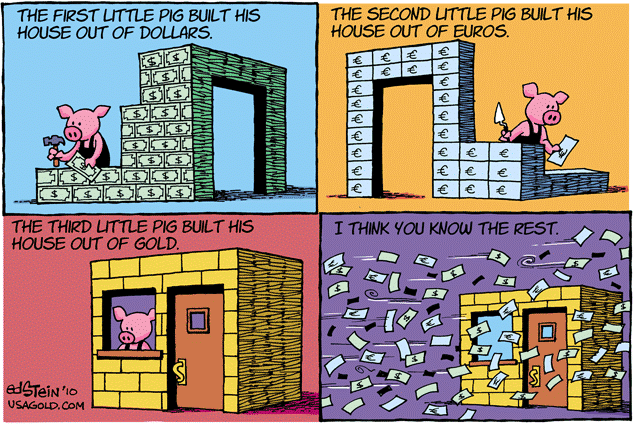 It is unequivocally not a capital raising mechanism for companies. Money flows into juniors directly from investors who buy shares issued by the companies. I’ve chatted with several junior mining stock CEO’s – true juniors – and they have all said one thing in common: there is a lot of money being made available to the junior mining companies by both large institutional investors and strategic investors. The rebalancing of GDXJ and the share suspension of JNUG will have zero effect on this. Too be sure, the author presents some interesting theories about what is happening with GDXJ and JNUG using some charts he presents. But charts only show facts about the directional moves made by stocks. They don’t explain why those moves occurred. The author’s views on why the moves occurred are theories, not facts. To compound the problem, the author uses a 5-day trading period with which to draw conclusions. 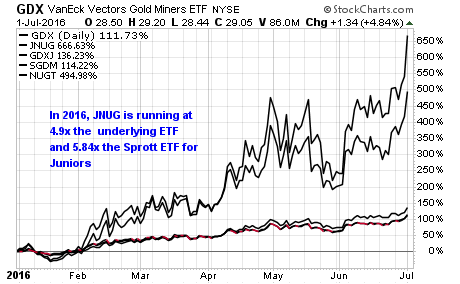 The short term divergences shown in the chart comparing JNUG to the various leveraged miner ETFs is most likely explained by the fact that some hedge funds/traders got ahold of the GDXJ and JNUG news and decided to front-run the market. Any seasoned market veteran knows that you can’t use just 5 or 6 days of chart data to make inferences about what may or may not be going on behind the scenes with capital flows and trade strategies. The ONLY conclusion we can draw from that chart is that JNUG underperformed the other ETFs over a 5 day period. So what? There could be any number of reasons why this occurred. The front-running explanation is the most likely. Well, that’s the problem. The author has his head buried in graphs. He can’t see the forest through the trees. There’s been several periods of time when the direction of the mining shares and gold/silver diverge over the past 16 years since the bull market in the precious metals sector began. I have had discussions about this quite frequently with my colleagues over the past 16 years. There’s any number of explanations for this occurrence. Furthermore, this trading anomaly was occurring before the existence of any of the mining stock ETFs. The use of the term “animal spirits” is most commonly attributed to John Maynard Keynes. But it originates from the Latin term, “spiritus animales” in reference to the spirit that drives human thought, feeling and action. We saw animal spirits at work in gold and silver on Tuesday this past week when the Dow dropped 237 points and gold quickly popped up $16. Silver jumped 72 cents, much to Wall Street’s surprise, on March 16th after the FOMC issued its latest monetary policy statement despite an assurance that the Fed would raise rates three more times this year. In the latest issue of the Mining Stock Journal I review a junior mining stock that was heavily promoted last summer ahead of a big issuance of stock. Many of you may own it thinking you sitting on junior with close to 20 million ounces of gold in the ground. What I found when I examined the background of management and quality of the alleged mineralization on the company’s properties, with no plans for advancing the properties, might shock you. This stock is down 50% from its highs last summer and insiders were dumping shares in September before the stock sold off. This is a stock you want to avoid and you can find out more about it by subscribing: Mining Stock Journal subscription info.